Street food organisers and underground (food) party starters Brum Yum Yum are creating a fantastic food rumble in King's Heath called FlavaClash. It will be hosted at The Old Printworks between the hours of 6.30pm and 10.30pm on 10th October, and it promises to be spectacular. I know about the bravado, the PR and smoke screen that comes with events of this scale, but when push comes to shove and you're biting through a brioche bun to grass-fed high grade beef fillet with a home made mustard mayo and fresh lettuce and hnad-churned salsa, you're silenced into submission. The proof is in every bite, and with each event from Brum Yum Yum, the food delivers. I think the key thing about Brum Yum Yum's FlavaClash is that the cooks aren't hiding, or running away from heavy seasonings and rich aromas. Instead they are giving it all they've got, to win over the crowd. Funnily, you are the judge, and Duncan Stanley (the man behind BYY), is eager to know what you really think. It's a fresh approach to dining, and puts the chefs in touch with customers on a level playing field. The food will be prepared there and then, so the contenders - much like a boxing match - can't hide any bruises. The crowd will see it all, and ultimately deem a food vendor the winner. 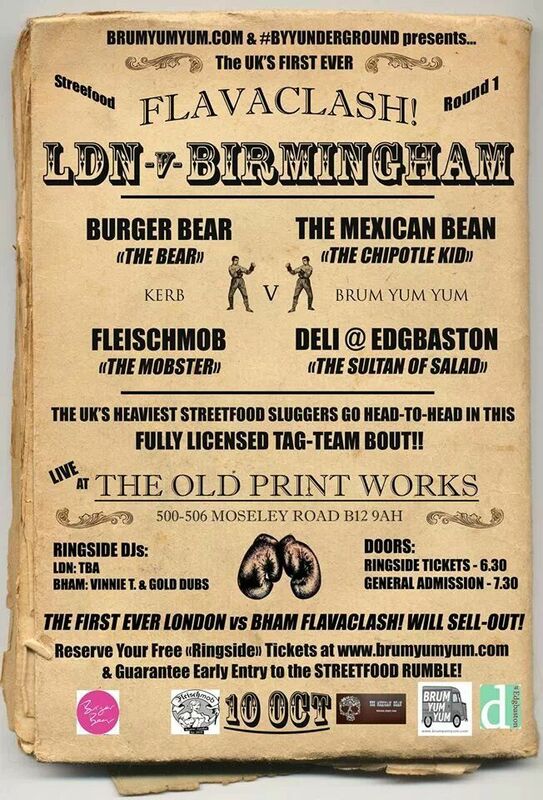 It is a clash of cities: London vs Birmingham, with two food vendors representing their city. Burger Bear and Fleischmob will be rocking up with handmade burgers and Austrian schnitzels whereas the Birmingham lot will be taking a different approach. Deli at Edgbaston and The Mexican Bean are making mouths water with their offerings of smoked chipotle with South American seasoning and unexpected salad for clever eating. Tickets are free, so all you have to do is reserve a ticket, and show up. You can order a max of four tickets per person, so you and your friends/mum/partner can enjoy the food from each vendor, and judge yourself who wins the flavaclash.